"Catch & Release of large Fish"
There is no doubt that the "Catch & Release" fishing phenomenon has become the angling norm of the 90's! It is a philosophy which is doing much to enhance the resource and provide added fishing pleasure for many anglers. There has been a strong trend for the past two decades in the practice of 'catch-and-release' when angling for steelhead. In fact many steelheader hold this classic trophy trout in deep reverence. Regulations have followed this angling attitude to preserve the limited numbers of steelhead and as well, the angler's opportunity to angle. This latter point is one for which I have been a strong proponent for many years; the preservation of our right to angle. 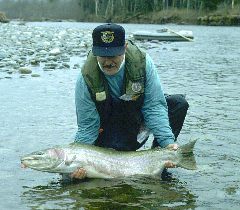 It is interesting to note that approximately 80% of all steelhead beached in British Columbia are now released. Well over 90% of those released do survive according to extensive Pacific Northwest 'catch & release' studies! 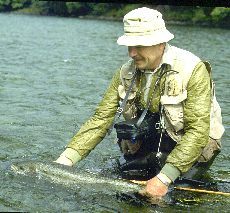 It was in the late 70's that killed and released steelhead became equal in the angler's catch. 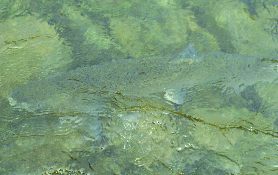 Since then, and, even with the introduction of hatchery steelhead in the 80's, steelheaders continue to release many more steelhead than they kill, promoting "Catch & Release" angling. But, what about saltwater salmon? We all know how difficult it is to release a 60cm chinook. It is just undersize but, still large and powerful. In a conversation with Terry Gjernes, South Coast Coordinator for Recreational Fisheries, he told me that a saltwater salmon catch and release study by Washington State supported his DFO studies which he had done in recent years in British Columbia waters. Washington State showed a 93% survival for coho and a 90% survival for chinook in a catch and release fishery. Terry did state that, "Handling doesn't make a difference, within reason. It is hook injury which seems to determine mortality, particularly haemorrhaging through the gill arches." Terry's study, by the Department of Fisheries & Oceans, DFO, is introduced in the video, "RELEASE 'EM RIGHT," produced by the Recreational Fisheries Division. The 13 minute video features Ted Peck and Terry Gjernes in Strait of Georgia waters, as they conducted the formal study of sports caught salmon on salmon caught with traditional sports gear. 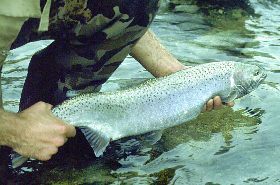 All salmon caught were released after observation and holding, following 24 hours in a saltwater aquarium. The results presented in the video are quite interesting and should have long range management implications for salmon sports fishing in British Columbia. 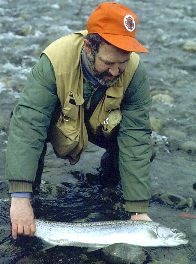 I have long known that released steelhead survival is very high providing the fish is released in a careful manner. But, until this DFO publication, I was unaware that the salmon survival rate in saltwater was equal or even greater than that for released steelhead. "Wool gloves are not in the fishes best interest because of the potential loss of mucus." He also felt that gloves were likely to provide serious disease transfer between watershed by our mobile steelheaders who regularly fish more than one stream. Throughout my discussion with anglers at these meetings the only common thread was one of not handling the fish. Many felt that in this way the angler was certain of not knocking off scales or wiping off the mucus. Studies I have read about these two fish body coverings, scales and mucus, indicate that the mucus is the most important. There is an indication that salmon can loose many scales and still survive with a healthy life. But, should they loose a concentrated area of their slimy mucus they will inevitably die from infections. We know from many studies that most steelhead are strong fish capable of a full recovery in a matter of twenty-four hours after capture and release by anglers. The statistical numbers vary between an 85% and 95% recovery but, they are dependent upon a number of factors which include; how long the fish has been played; the water temperature; the supply of oxygen; the physical handling which has occurred; and, the actual injury caused by the hook. I hold some reverence for this majestic anadromous rainbow trout for I believe that they are the key indicator, the barometer of the health of our streams. I do believe that they should always be treated with respect and dignity. In their brochure, "Releasing Fish the Gentle Way", the Fisheries Branch has four excellent recommendation which I would refer to all anglers. Play and release fish as rapidly as possible. Be quick but gentle when you remove the hook. If you must handle the fish, do so with your bare, wet hands. We have long known that small trout have a high survival rate (90%+) if they are released carefully. Now that recent studies have shown that large fish like salmon and steelhead also have a large survival rate I am certain that the 'catch & release' angler attitude will continue as the future norm.